::::When in September Nadja from Schnittchen wrote me and asked if I wanted to take part in their Sewing Around the World project, of course I said yes! I was very excited to try their patterns. At the time I was pretty stressed out and it definitely conditioned my choices: February, usually a quiet month for me and the Anna Dress pattern, a simple design from the summer 2015 collection: an A-Line dress with kimono sleeves and pockets. ::::When I saw it, I immediately thought winter denim dress. then I saw this gorgeous viscose fabric at 1000 Stoff. It came in several colours. Immagine the cartoon lightbulb: color blocking! 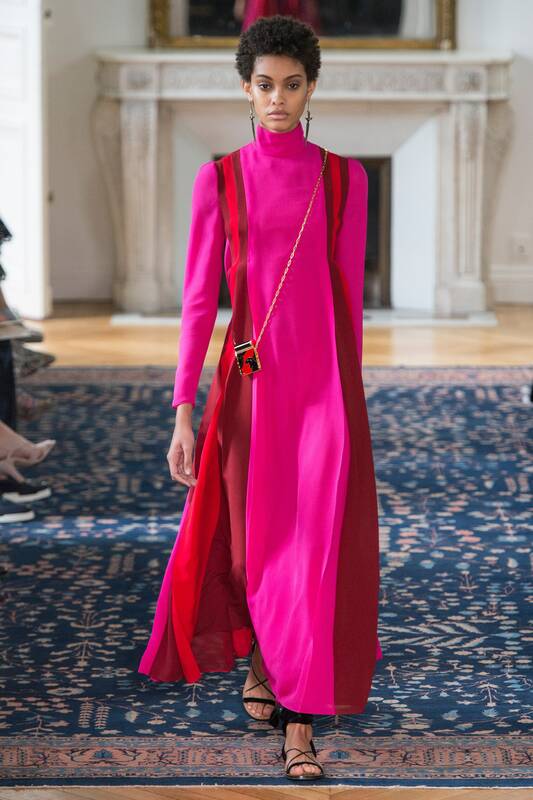 I completely changed my plans and my version of the Anna dress became a color blocked, light, flowy summer maxi, inspired by this Valentino dress. The idea was to take the concept behind it... the flow, the vertical color blocks and make it more day-to-day life in a small Italian town "accessible". That neon pink is beyond gorgeous but I don't want any of my neighbours to die because they forgot to close their mouths and breathe. I ordered the Lilac and the Silver Grey versions of the fabric with the intention of dyeing part of the silver one graphite grey, which I did - it took the color beautifully! ::Quando lo vidi pensai immediatamente di fare un vestito invernale in denim. poi ho trovato questo favoloso tessuto in viscosa da 1000 Stoff. A catalogo erano presenti svariati colori quindi mi si è accesa la lampadina: color blocking. ::::The pattern is really simple and easy to sew. It has two main pattern pieces (a front and a back) and three secondary pieces (front neckline facing, back neckline facing and pocket). The included. seam allowances are 1cm. I lengthened the side seams to a maxi length and reduced the neckline opening by 1cm (basically I added 1cm seam allowance treating the existing neckline cutting line as a sewing line) to be able to divide nicely the colours over the shoulders. Anyway, using the wool voile was a bad idea. It made the making of this dress so much difficult: the viscose grows and the wool shrinks. I cut the top part of the blue pieces from two layers of fabric to control the “show” and encase the seam allowances. It took a lot of fiddling and hand basting! ::Il modello del vestito Anna e molto facile da cucire. È composto da due parti principali (un davanti e un dietro) e tre parti secondarie ( paramontura collo avanti e dietro e tasca). I margini di cucitura sono di 1cm e sono inclusi. Ho prolungato il davanti e il dietro fino alla lunghezza maxi da me desiderata e ho ridotto l’apertura del collo di 1cm (ho considerato il margine di taglio come linea di cucitura e ho aggiunto ancora 1cm come margine di cucitura) per poter dividere meglio i blocchi colore sulla spalla. Ho tagliato tutto quanto e mi stavo preparando per imbastire a macchina per vedere se funzionava come disegno, ma avevo fissa nel cervello l’immagine del vestito di Valentino con l’uso brillante della trasparenza. Un altro cambio di programma. Avevo nella mia “collezione” di tessuti 😛 un voile di lana blu oltremare scuro e ho deciso di usarlo. ::::I love how it turned out and I'm glad I did it. I really like the contrast in the fabric but I wouldn't do it again. Needless to say, this is now dry-clean-only. ::::As I said before the pattern is really simple. In my opinion is one of those patterns that do not require lots of fitting and are a great base to experiment with fabric manipulations and color blocking. Maybe play a little game and use as inspiration the geometric abstract paintings of artists such as Mondrian, Malevich, Albers or the more organic forms of Jean Arp, for example. ::::To sum things up, I liked the pattern first of all because it worked and it didn't require fitting. I was worried about gaping at the back of the neck. As you can see there's none. I didn't try the dress on until it was almost finished... it was a huge risk. With the amount of work that went into making this I would have been very upset if it didn't fit or had construction issues. The pattern in its original form is really easy to sew but the instructions come as a text outline of the sewing process so maybe it's not for the absolute beginner that needs a little more hand holding. I also love the fabric from 1000 Stoff. It's a viscose cloth of very good quality and it's fairly priced. It's similar to the Atelier Brunette viscose but has a fuller hand. It drapes beautifully but it also wrinkles ... a lot... just by looking at it... like light linen or ramie fabrics do; therefore it's not very suitable for structured garments. I'm considering buying another piece to make the Jane Shirt by Ready to Sew or the newly released Bias Top by Just Patterns, the collaborative project launched by the ladies behind The Pattern Line and Sewing Tidbits. And finally, I love the dress. Now I need some summer. I can't wait to strut on the walk along the beach in Lignano, the evening sea breeze playing with my dress, making it move and dance ... believe me this dress moves beautifully - the inside winter pictures make it no justice. I'll have to update this post with some outside pictures and Instagram is going to see a lot of it as soon as summer decides to come. ::Per tirare le somme, mi è piaciuto il modello in primis perché ha funzionato e non ho dovuto adattarlo. Ero preoccupata per il collo dietro e sono stata molto felice quando ho visto che stava perfettamente adeso. No mi sono provata il vestito addosso finché non è stato quasi del tutto finito… un rischio immenso. Con tutto il lavoro che ci ho messo sarei stata molto arrabbiata se in un cartamodello così semplice trovavo errori di progettazione. Nella sua forma originale il vestito Anna e molto facile da cucire ma le istruzioni sono sotto forma di testo, molto sintetiche, un po' come quelle di Burda; quindi magari non adatte per la sarta alle primissimissime armi. Adoro anche il tessuto preso da 1000 Stoff. E una tela di viscosa di qualità molto buona a un prezzo onesto. È simile alla viscosa di Atelier Brunette ma con una mano un po’ più piena. Drappeggia molto bene ma si stropiccia … tantissimo … basta guardarlo che si stropiccia … come il lino leggero o il ramie. Dunque, non è molto adatto per capi più strutturati. Sto pensando di prendere un altro pezzo per farci forse la camicia Jane di Ready to Sew o l’appena pubblicato Bias Top di Just Patterns, il progetto collaborativo lanciato dalle autrici di The Pattern Line e Sewing Tidbits.